Welcome to the fifth post in our series on “Game of Thrones” fashion. 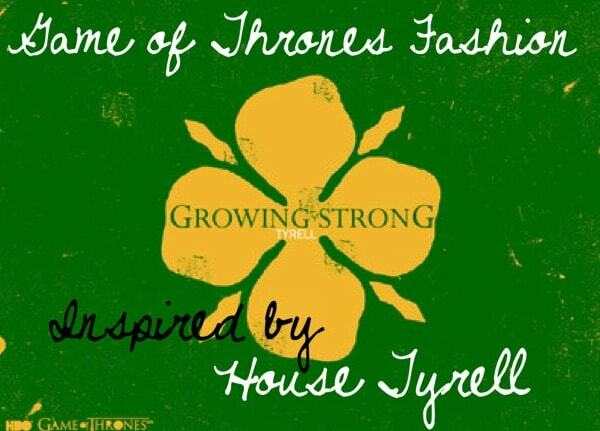 If you haven’t read them already, be sure to check out our previous articles on fashion inspired by House Stark, House Lannister, House Targaryen and House Baratheon. House Tyrell (my personal favorite of the Great Houses of Westeros) pretty much has it made right now. They rule “The Reach”, the southern region of Westeros, a beautiful, fertile land that has made the Tyrells ridiculously wealthy – almost as ridiculously wealthy as the Lannisters. Put an updated twist on House Tyrell’s signature ethereal garb by sporting some floral skinny jeans. The edgy cut and feminine print of this particular pair creates a modern contrast. Next, add a sheer, loose-fitting mint green collared top to give the outfit a dreamy spin. Accessorize with nature-inspired jewelry, like coral rose drop earrings and a gold leaf charm necklace. Complete this springy look with braided sandals and grassy green nail polish. Sport a lace-detailed high low dress as if it were a suit of armor to channel the effortless grace of Loras Tyrell, also known as the Knight of Flowers. His dazzling good looks and unquestionable skill solidified him as one of the most celebrated knights in all of Westeros, and he shows it off in style. Pair your dress with golden gladiator sandals and a floral embellished headband for an airy, outdoorsy look that our nature-loving knight would definitely appreciate. Add bold jewelry like shield drop earrings and an armor-like ring to symbolize Loras’s skill and inner strength. Grab a graphic floral clutch and you’re ready for the jousting tournament! (Okay, not really – don’t wear a sundress if you’re going to be on a horse. Trust me). Margaery Tyrell is even more gorgeous than her brother Loras, but don’t be fooled by her delicate appearance – her gentle exterior masks a quick wit and ferocious ambition. Seriously, you do not want to get in this girl’s way, especially when it comes to the Iron Throne. Margaery has no doubt that she will be Queen someday, so we shouldn’t doubt her either. Margaery (played by the exquisite Natalie Dormer) favors long, flowing dresses that show a little skin, so cut-outs are a must. Grab a dreamy blue maxi dress with subtle side cut-outs, then add a floral circlet to channel your inner queen. Try expressive, yet simple jewelry like a long, pearl drop necklace and dazzling floral studs to add a little drama to your look. Stackable crown-shaped rings symbolize Margaery’s many paths (er, husbands) to the throne. Modernize the ensemble with a sparkly clutch and strappy pumps. Who’s your favorite Tyrell? What do you think of season three so far? Be sure to leave a comment and let me know what you think of the outfits – I love hearing your thoughts!